The students at Assumption Catholic School had many questions for their new Pastor and Chief Administrator, Fr. 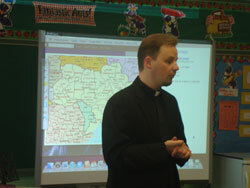 Ivan Turyk when he visited the different classes at the parish school this week. He went room-by-room, greeting the children, inquiring about their secular and religious studies, discussing sports and lightly quizzing them on religion. Fr. Ivan spent about 30 minutes answering questions in the classrooms from fourth through eighth graders. He answered questions like: What was your favorite subject in school? How many languages do you speak? What is your favorite food? What do you like best about being a priest? "You are very, very lucky to live and go to school in the USA," he told the children, because in other countries children walk to and from school, typically don’t have enough books and receive a much lower quality of education. Fr. Ivan reminded children to be appreciative of their school and go home and tell their parents, ”Thank you for sending me to Catholic School and giving me the opportunity to learn about God and the opportunity to seek God’s will in everything that I do”. He also pointed out that spiritual and academic achievements in the parish school are a result of the dedicated commitment of school teachers, religious sisters, staff, pastors, board members, lay volunteers, parents and parishioners who for almost 50 years continue to contribute their time, treasure, and talents to the prosperity of the parish school. At the end of his visit, Fr. Ivan asked children to pray for him and he promised to pray for them.